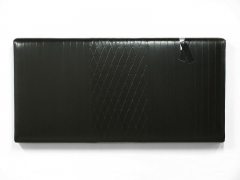 James Cohan Gallery is pleased to present OBJECT FICTIONS, a group exhibition curated by Jessica Lin Cox and Elyse Goldberg, opening on January 6 and running through February 11, 2012. 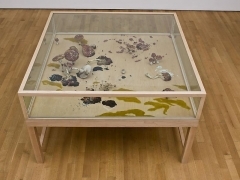 The exhibition includes work by Helene Appel, Richard Artschwager, Yael Bartana, Talia Chetrit, Patricia Dauder, Harrell Fletcher, Tom Friedman, Noriko Furunishi, Robert Gober, International Necronautical Society (INS), Matt Johnson, Louise Lawler, Jennifer Marman and Daniel Borins, Allan McCollum, Kaz Oshiro, Trevor Paglen, Roxy Paine, Katie Paterson, and Alison Elizabeth Taylor. OBJECT FICTIONS assembles a diverse group of artists whose works investigate notions of perception, in its many definitions. 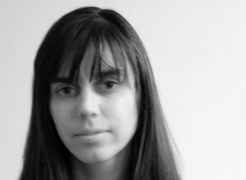 Through a variety of media and processes, these artists explore the potential of ordinary objects, historical events, invented narratives and in some cases even other artworks, to expose reality through the lens of fiction. Through sustained looking, the works in this exhibition challenge us to consider what constitutes an object, an image, and in the broadest sense, what constitutes truth. In her exquisite paintings on raw linen, such as Chopped Leek (2011), Helene Appel focuses her minimalist version of trompe l’oeil on often overlooked common objects, elevating the ordinary to the extraordinary. 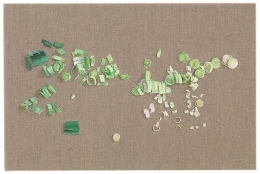 In a recent essay on Appel, Anna-Catharina Gebbers states: “Her subjects have already been accessories to the performances of the everyday; the chopping of onions, the sweeping up of crumbs. Now, placed on the canvas, the things can act to reveal themselves.” In Appel’s work, it is the careful, painstaking process of crafting the fiction of the object which reveals the intricacies and depth of dimension contained within the object itself. This moment of subversion and the sudden shift in perception is an important conceit for many works in the exhibition. 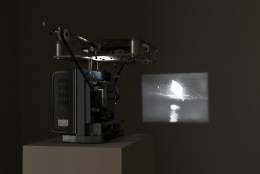 Patricia Dauder’s 16mm film, March 5th, 1979 (2011), portrays luminous phenomena in the Canary Islands long-rumored to be extraterrestrial in origin until they were recently revealed to be the result of ballistic missiles launched from US Navy submarines. Noriko Furunishi creates mysterious vertical landscapes recalling Chinese and Japanese traditional hanging scrolls, which upon further examination are actually collaged images taken from multiple points of view. 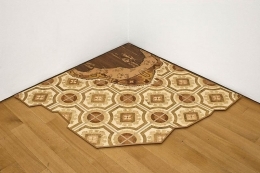 Matt Johnson and Robert Gober are renowned for creating works that thwart our expectations of the objects they appear to resemble. 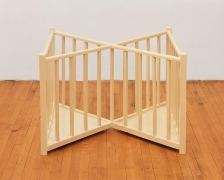 Gober’s X Playpen (1987) references a familiar domestic object known to promise security, but has instead been drastically changed to amplify latent anxieties about childhood and the home. Johnson’s Mother and Child (2011) wryly plays with the sanctity of representing these revered religious figures in art history, transforming Mary and the infant Jesus into a duct-tape sculpture cast in stainless steel. 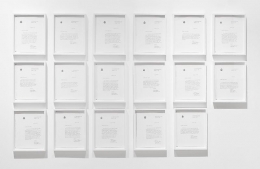 Trevor Paglen’s series of documents, Seventeen Letters from the Deep State (2011), are photocopies of what appear to be forged US State Department letters authorizing “extraordinary rendition,” the illegal transfer of suspected terrorists outside the bounds of legally protected territories for the purpose of gathering intelligence via torture. The letters are signed by a State Department official named "Terry A. Hogan," whose signature, upon closer inspection, is noticeably different throughout the series. Other evidence unearthed by journalists indicates that this official may have never existed. 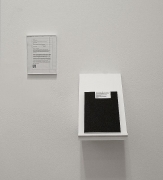 Also on display is an “authorized copy” of Calling All Agents: Transmission, Death, Technology, General Secretary’s Report to the International Necronautical Society (2011), a document of the fictive society founded by Tom McCarthy in 1999. Though operating as a fiction, the International Necronautical Society nevertheless creates a space for discourse and interventions in art and culture through publications, lectures and other public forums. 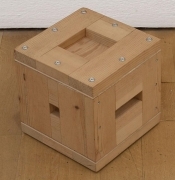 Richard Artschwager’s small crates, Untitled (1000 Cubic Inches) (1996), are part of a special edition created for Parkett magazine. Made of untreated pinewood, the crates are carefully fabricated with the elements and protective coverings common to the transport of fine artworks. However, in this case the crates themselves are the artwork, serving as visual imposters that call into question both content and context. Yael Bartana’s photograph from the series, The Missing Negatives of the Sonnenfeld Collection (2008), creates an intervention into the collection of well-known photographs by Leni and Herbert Sonnenfeld. Documenting early Jewish settlers to Palestine in the 1930s, the Sonnenfeld photos were a galvanizing set of images that helped to promote the early organization of the state of Israel. 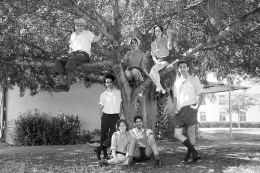 Using the same visual tropes of early Communist and propagandistic styles, Bartana’s utopian image depicts young Jews and Palestinians living together on a kibbutz in Tel Aviv, jointly building a peaceful community (without war). Tom Friedman’s Unique B/W Photo (1997) is a self-portrait created from all the found negatives of photos taken of him growing up. Using his father’s enlarger, Friedman exposed each negative, consecutively, for a fraction of a second. Upon closer inspection, ghostly outlines reveal themselves and disappear in the same instant, reminding us of the fleeting nature of memory. A commissioned work for the exhibition, Jennifer Marman’s and Daniel Borins’ Stripped (2012), is a curtain of PVC strips across the entrance of the main gallery onto which the artists have appropriated and abstracted the visual style of document censorship and redaction. 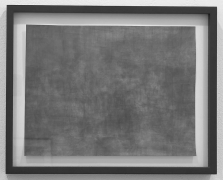 The work relates to large format geometric painting, yet also transcends the formal to comment on the lack of transparency in (exhibitions) politics. Allan McCollum’s The Dog From Pompei (1991) is a series of replicas made from the famed plaster cast of a chained dog smothered in ash from Mount Vesuvius in ancient Pompeii, 79 A.D. It was produced in collaboration with the Museo Vesuviano and the Pompei Tourist Board, Pompei, Italy, and Studio Trisorio, Naples, Italy. Katie Paterson’s Light bulb to Simulate Moonlight (2009) consists of ice-blue incandescent bulbs designed to transmit wavelength properties identical to those of moonlight. It was created by the artist in collaboration with OSRAM, a German light bulb manufacturer.